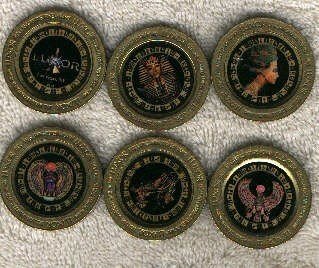 Luxor Hotel/Casino collectible tokens(6) ? Luxor Hotel collectible slot tokens. Each token has a different picture - Sphinx, Nefertiti, Pharoah etc. Very collectible. These tokens have been used in actual, live gaming. They are now very rare, the Luxor has changed them for other tokens.